Half a mile from Benaulim Beach, San Joao Holiday Homes offers apartments with a kitchenette. It features an outdoor swimming pool, spa center and multi-cuisine restaurant. Free Wi-Fi and parking are provided. The air conditioned rooms at Holiday San Joao come with hardwood furnishings. Each well-furnished room is equipped with a TV, personal safe and private bathroom with shower facilities. Guests can enjoy a variety of body treatments at the spa center. With a 24-hour front desk, staff can assist with car rental services, while sightseeing and travel arrangements can be made at the tour desk. The restaurant serves a variety of local and international dishes. Outdoor dining options are also available. 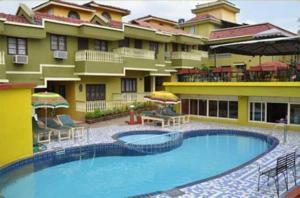 Holiday Homes San Joao is 65 ft from the Holy Trinity Church and 2 miles from Colva Beach. Dabolim Airport is 17 miles from the hotel. Free! All children under 6 years stay free of charge when using existing beds. One older child or adult is charged INR 600 per night and person in an extra bed. Maximum capacity of extra beds in a room is 1. There is baby beds in a room is 0 capacity for cots in the room. Any type of extra bed or crib is upon request and needs to be confirmed by the hotel. Supplements will not be calculated automatically in the total costs and have to be paid separately in the hotel.